Hey guys. I’ve tried Googling various solutions, reading the Bootstrap documentation, and searching for YouTube tutorials, but it seems I’m not so sure on how to get my navbar buttons to fit in a line. I’m using CodePen, and I’ve provided my code below to show you what I’m doing. I’ve tried whittling the problem down to its essentials by starting with the most basic navbar possible but nothing I do seems to be working, even the grid system tags (not shown). Thanks, fellow campers! I’ll appreciate any advice here, really. Been spending 6+hours trying to figure this out to no avail. Did you included bootstrap CDN at first ? Cause u cannot use bootstrap without the library. 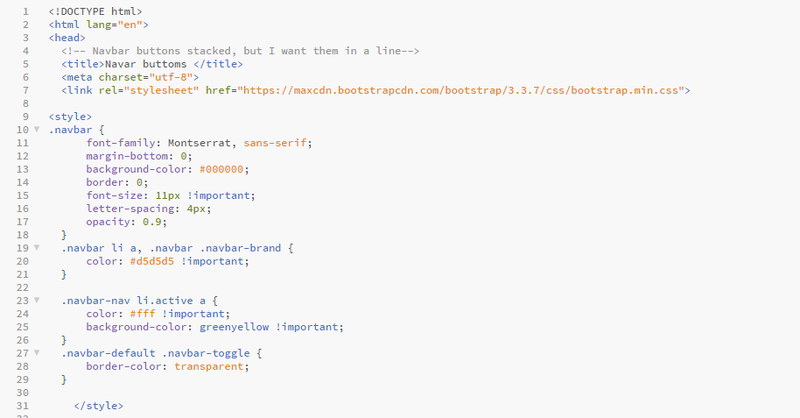 Wait, so even with adding Bootstrap 3 and 4 using quick-add in CodePen i still need to add the cdn link? Okay, sorry. i didn’t include everything from my project in thos code sample. Bootstrap is already working on my pen. I have 2 divs below this sorted with the bootstrap grid system and using various bootstrap styling classes so i know it’s there. What’s up with all the code screenshots? You can enter a code block into the forum by preceding it with a line of three backticks and follow it with a line of three backticks to make easier to read. See this post to find the backtick on your keyboard. The “preformatted text” tool in the editor (</>) will also add backticks around text. Well, I admit, I didn’t have the CDN. I appreciate you having me paste that in there. Whoops .-. I’ll get back to this later and let you know if the other things you showed me fixed it. Okay, guys! I solved it. Turns out I needed to give the unordered list the class “nav” in order for the whole thing to appear in a bar format.